This is our puppy, Juno, at about 3.5 months old. The big girl is Tyra, my parent's shepherd, and she's 6. Myself and my girlfriend moved about 5 hours away from my family, so we were both missing Tyra a great deal. We waited until we were settled in our new home and then we started looking for our perfect puppy. We knew it was going to be a German Shepherd, it was just a matter of finding the right one. We knew right away when we saw Juno, and she's been amazing so far (she's now 6 months old). This picture was taken within hours of Tyra meeting Juno. 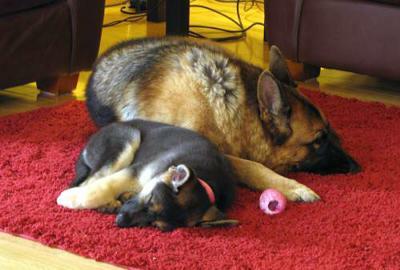 Haha, Tyra found it tough to match Juno's energy, but it was adorable that Juno wouldn't let Tyra out of her sight. When Tyra slept, Juno tried her best to nuzzle up into her. This is just one of those moments.